Reliable distribution of television media signals to many types of devices within the home is important to the success of TV broadcasters. Julien Gauchet from Lea explained to me at the IPTV show that it is now possible for users to reliably transfer multiple high definition TV signals in the home over their electric lines. The latest versions of the HomePlug devices can transmit over 200 Mbps and automatically give priority to the transfer of digital video (A/V) signals. The maximum connection distances (up to 300 meters) can be further than wireless options. HomePlug systems can work well with WiFi systems providing high-speed interconnection data between access points and providing data access to areas where the wireless signal is weak or can’t reach. 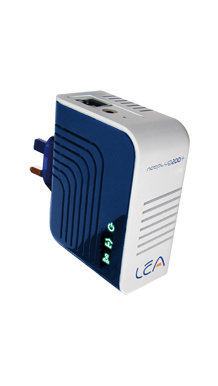 Users simply plug in their HomePlug devices or adapters and they automatically discover and connect to other HomePlug devices. It is possible to manage HomePlug devices using SoftPlug software that was created by LEA. This allows the user to identify, configure, and control HomePlug devices. The SoftPlug software can group the LEA HomePlug devices allowing for the creation of multiple data networks that share the same electrical lines.